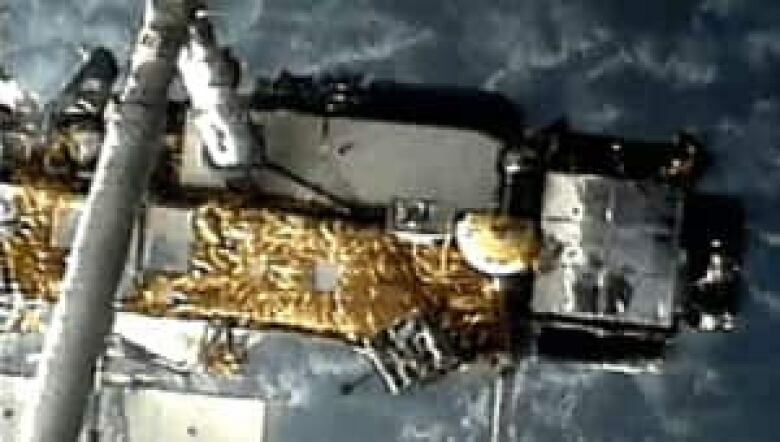 Mounties are shooting down reports that debris may have fallen in Okotoks, Alta., after a defunct satellite fell overnight. Officials in the U.S. and Canada are trying to determine where debris from an American satellite have landed, but the RCMP is shooting down reports that some pieces fell in an Alberta community. More than 10 hours after the spacecraft plunged over the north Pacific Ocean, U.S. space officials didn't know just where it crashed. Jonathan McDowell of the Harvard-Smithsonian Center for Astrophysics said the spacecraft entered the atmosphere around 12:15 a.m. ET over the coast of Washington state. He said much of the debris likely fell over the Pacific Ocean, but residents of one Alberta town believe the space junk may have landed in their backyard. A YouTube video and comments on Twitter have triggered speculation that debris may have hit Okotoks, a town south of Calgary. "We heard sirens last night and we wondered if that was related to it ... so I don't know. I wonder if people are wandering around looking for it now," said Okotoks resident Patti Sherwood. However, Okotoks fire chief Ken Thevenot says his department has found no evidence to indicate any debris fell in Okotoks. "We haven't heard of any debris in this area," said Thevenot. "We haven't responded to any calls, there haven't been any alerts that we're aware of." RCMP Sgt. Patrick Webb said the video is likely a hoax, adding police have heard nothing about falling debris in the area. "If that video is real, I will buy you a cup of coffee," Webb said in an interview. McDowell said he'd be surprised if anyone was hurt by the debris because it appears to have fallen in such remote areas. "I do think people saw lights in the sky and fireballs and may well be bits of UARS falling down," he said. The bus-sized Upper Atmospheric Research Satellite was NASA's biggest spacecraft to tumble out of orbit, uncontrolled, in 32 years. It was launched aboard space shuttle Discovery in 1991. NASA decommissioned the satellite in 2005, after moving it into a lower orbit that cut its life short by two decades.